We often like to look at home values by zip code in order to see if one area of the Tallahassee real estate market is performing contrary to the others, and today we will show you that this is indeed the case. After a strong 2013 when all six of the most active zip codes in Tallahassee posted gains in home values (real estate appreciation), 2014 has started off with an explosion in values for two of them, and a decline in one. That's right, a major zip code in Tallahassee is reporting a decline in home values for the first two months of 2014, and we didn't see it coming! Our first real estate graph shows home values (average price per square foot) by zip code for the past twelve years as recorded in the Tallahassee MLS. Home sales in three of the zip codes moved dramatically, with home values in 32308 and home values in 32301 advancing nicely, while home values in 32312 declined by 3.8% thus far in 2014. So how is it that the most active zip code in the Tallahassee real estate market is reporting real estate deprecation when we have been enjoying a healthy recovery in the housing market? Could it have something to do with distressed property sales? 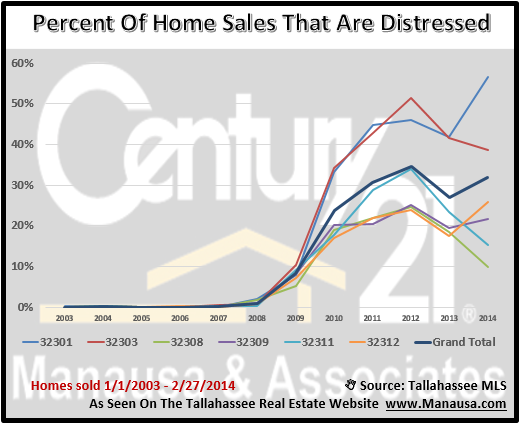 The real estate graph above and the following table shows the ratio of distressed home sales to all home sales in each of the top six zip codes in Tallahassee. Note that the 32301 and 32303 zip codes are far above the average (shown as "Grand Total" in the graph), while 32308, 32309, 32311, and 32312 fall below the average of 32% (yes, our distressed home sales are still 32% of all closings in the Tallahassee MLS for these 6 zip codes). 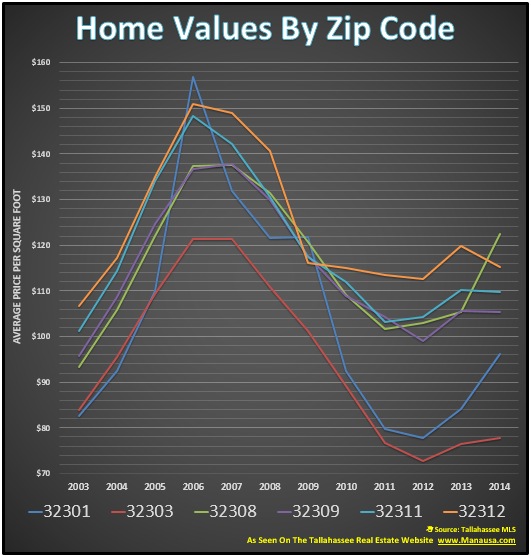 Apparently, our report on home values by zip code is not just reporting the liquidation of short sales and foreclosures having a significant influence on the value trend in the 32312 zip code thus far in 2014. Other areas are still seeing plenty of distressed property sales just like the 32312 zip code, so we will have to keep an eye on this to see if it is truly the start of a depreciation trend or if it is merely just "noise" in the data. We will continue to monitor home values by zip code and report any and all unusual real estate market trends in Tallahassee. Were you surprised because of the trend in 32312 or the overall market? Does this not fit with what I thought was an earlier newsletter item one or two months ago about the banks and lenders putting more short sales and foreclosures on the market this year? Or maybe it was another article in the press about the same kind of trend. As buyers, we notices that from December to now, we looked, and re-looked at houses that had been listed a long time, likely because they needed a lot of work and were being sold "as is" by the bank or lender! There were a lot of those ; and, very few "move in ready" not much work needed kinds of places for sale in the Tallahassee market. Were we disappointed, after hearing the number of listings was supposed to uptick in December/Jan? You betcha! Now I see where the listings have popped, but I don 't see it on Realtor.com. What's the deal? Cheers! Y'all come out to dine and dance with Deja Blu on Friday, March 14 at the Backwoods Bistro!!! As always, great charts and great info!